Note: For Indications for Use and detailed information concerning the ShuntCheck III product and procedure, please refer to the Operating Manual here. ShuntCheck uses non-invasive thermal dilution to detect fluid flow in CSF shunts. Shunt flow moves the cooled CSF “downstream”, cooling the skin under the thermosensor. The sensor monitors the skin temperature during the two ice placements and for 4 minutes after the ice is removed. Sensor data is analyzed by the ShuntCheck software and test results are displayed on a laptop or tablet computer. The results screen below illustrates what the results may look like for a flowing shunt. The panel on the left summarizes patient and test information including the test result of Flow Confirmed. 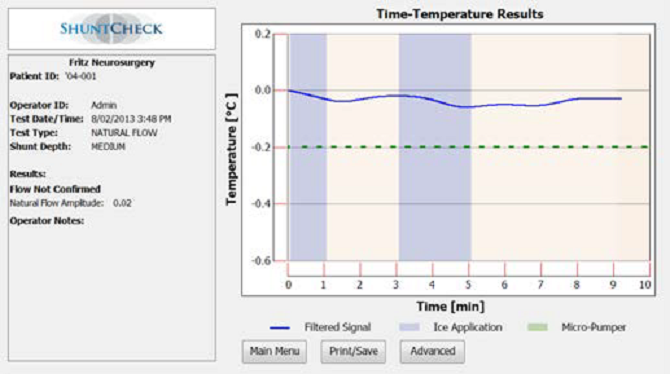 The panel on the right presents a time-temperature graph of sensor data. (The blue bar shows the 60 second and 120 second ice pack placement periods). 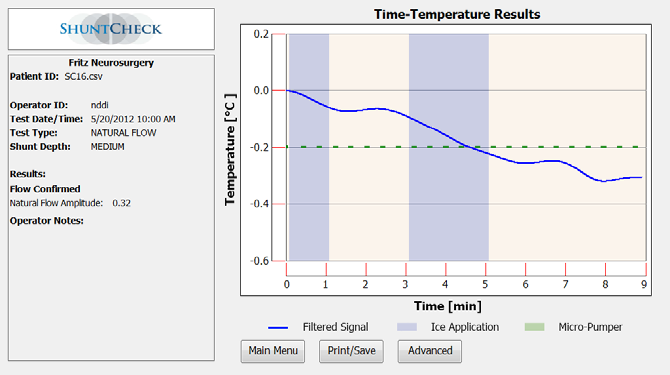 This test shows a 0.32°C temperature drop due to chilled CSF flowing beneath the sensor. The results screen below illustrates what the results may look like for a non-flowing shunt. Since the shunt is not flowing, cooled CSF has not reached the sensor and the time-temperature graph shows no temperature decrease. This test summary is Flow Not Confirmed. 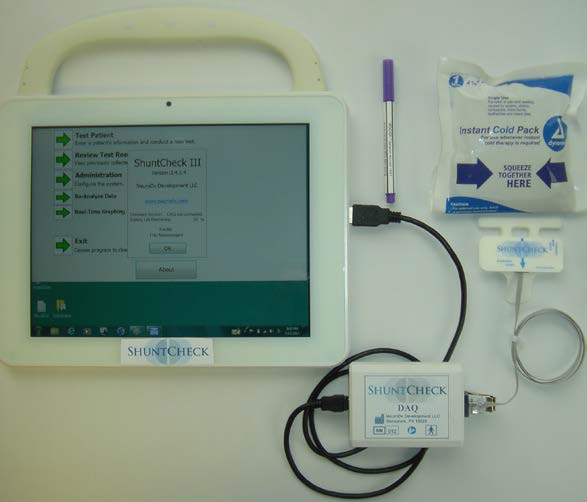 The ShuntCheck III system consists of three components – the ShuntCheck Thermosensor (which monitors skin temperature), the Data Acquisition Unit (DAQ – which converts the sensor signal into digital format), and a battery‐powered Windows computer (laptop, tablet or “COW” operating on battery power) running ShuntCheck software. The ShuntCheck Test Pack also includes an Instant Ice Pack plus a skin marker pen, so that all the items required for the test are included in a clamshell pack.